You should choose wild goose or duck grass (more meat, less fat). Experience: Put your hands on the duck chest,if the duck chest is plump,the ducks look healthy,you can buy them.For ducks have prepared, you should note skin of them,the skin is yellow, duck chest is plump,the ducks are delicious. If you want to the duck cook in fermented beancurd sauce is delicious,you have to marinate the meat of duck with spices before cooking. Marinate 5 fermented bean curd with a kg meat of duck, add a little sauce, sugar, ginger, garlic, peppers. Marinate from 20 to 30 minutes for permeate spices. 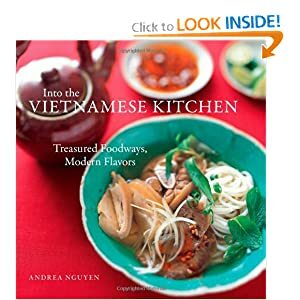 when you make the duck cook in fermented beancurd sauce,you must use ingredients such as potatoes,spinach, coconut milk,rice vermicelli,sugar,delicious fish sauce, cooking oil. To fry the ducks, pour coconut milk in the pot. To boil, skim froth, To cook over a low heat about 20 minutes for duck is soft,pour potato to the pot and continue cooking. Sometimes add a little coconut milk to the pot to not dry. 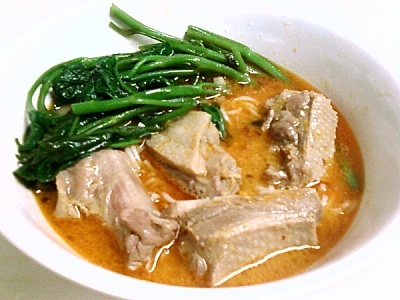 When the meat of duck is soft,ladle soup out into bowls.Served with spinach,rice vermicelli. Note: Because the fermented bean curd is salty,so that you need to add or reduce spices follow your taste when you are cooking. Sauce: Sauce also contribute to your duck soup more charming and tastier. Make sauce like recipe below: 5 white fermented bean curd+2 tbsp sugar+ 2 tbsp lemon juice.Mix all of them together, add the garlic, chilli,pounded ginger.Served with spinach,sauce and rice vermicelli.